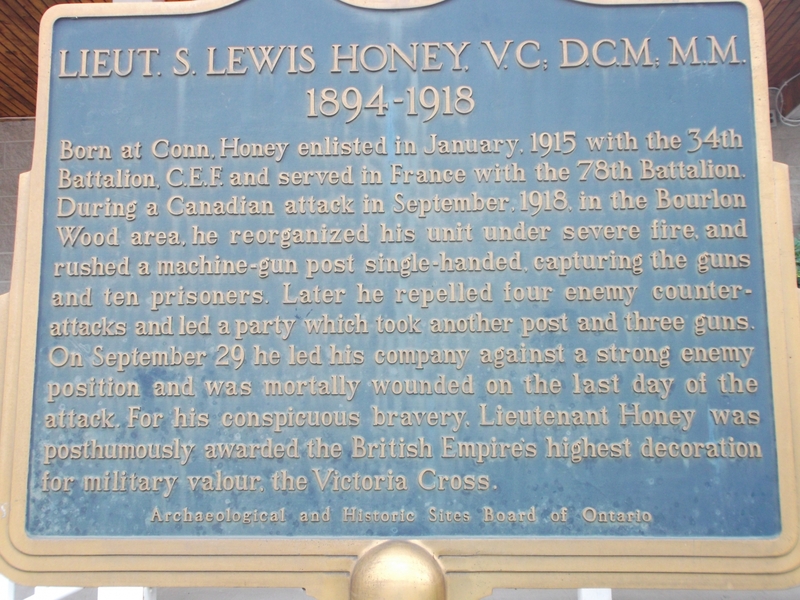 Born at Conn, Samuel Lewis Honey enlisted in January 1915, with the 34th Infantry Battalion, Canadian Expeditionary Force (C.E.F.) and served in France with the 78th Battalion Grenadiers. During a Canadian attack in September 1918 in the Bourlon Wood area, he reorganized his unit under severe fire, and rushed a machine-gun post single-handed, capturing the guns and ten prisoners. Later he repelled four enemy counter-attacks and led a party which took another post and three guns. On September 29 he led his company against a strong enemy position and was mortally wounded on the last day of the attack. For his conspicuous bravery, Lieutenant Honey was posthumously awarded the British Empire’s highest decoration for military valour, the Victoria Cross. He also received the distinguished Conduct Medal, and the Military Medal. Lieutenant Honey was the son of Rev. and Mrs. George E. Honey, while Rev. Honey was the Methodist Missionary on a circuit of small churches in the Conn area. 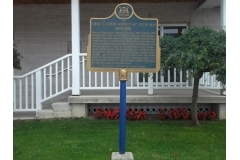 The plaque now standing outside the Legion in Mount Forest, was originally situated beside the Westcott United Church in Conn.